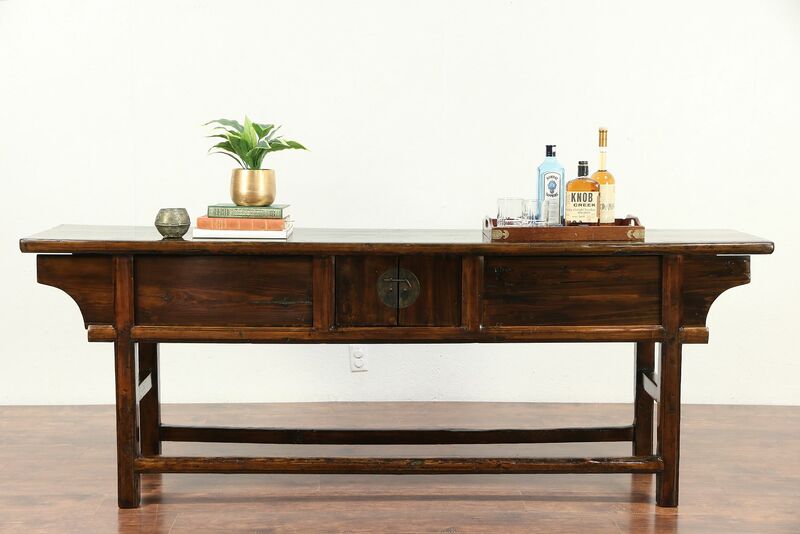 A traditional Chinese family altar table from around 100 years ago could also serve as a sofa table or hall console. Hand hewn of solid pine, there are center doors plus sliding doors at each end. Altar tables were the most treasured piece in a Chinese home, set with family pictures and memorabilia, used for burning memorial incenses. The glossy restored finish is in excellent conditio, preserving loads of antique character - stains, mars, losses and shrinkage separations from age, see photos. This Asian furniture has wonderful warm patina. Size is 87" long, 19" deep and 32" tall.